There are striking similarities between the objectives of Churchill's speech nearly 75 years ago and Netanyahu's today; both with no less purpose than to avert global conflagration. And, like Churchill's in the 1930s, Netanyahu's is the lone voice among world leaders today. There is no doubt about Iran's intent. It has been described as a nuclear Auschwitz. Israel is not the only target of Iranian violence. Iran has long been making good on its promises to mobilize Islamic forces against the US, as well as the UK and other American allies. Attacks directed and supported by Iran have killed an estimated 1,100 American troops in Iraq in recent years. Iran provided direct support to Al Qaeda in the 9/11 attacks. Iran's ballistic missile program, inexplicably outside the scope of current P5+1 negotiations, brings Europe into Iran's range, and future development will extend Tehran's reach to the US. During the Israeli Prime Minister's speech, I was struck by the analogy he made between ancient Persia and today's Iran, when he called attention to the fact of deadly threats to the Jewish people. Today, we have the mullahs promising to rain death and destruction on Israel and all Jews. In ancient Persia, it was Haman not only making threats but set to carry them out. Esther, married to the Persian ruler, placed her life in jeopardy and went to the King to inform him of this terrible plot to murder all the Jews in Persia and the tables were turned on Haman. Mr. Netanyahu made reference to all the plots and threats the Jewish People have suffered through out history, and yet we're still here. The question is, can we depend on this "Divine Intervention" to continue, or is the world's time finally up? 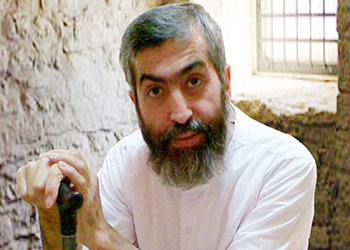 Iran's population is now 80 million strong and shackled by one man into slavery. Netanyahu addressed the youth of Iran in Farsi and reached them in spite of the Ayatolla's command that shut down more than means of communication. Iran's people have never been slaves to anybody, and only they can do what the world is waiting for them to do. Hope gets weak in the knees when one considers that American broadcast media largely ignored the extremely important addresses of Israel's Netanyahu to the American-Israel PAC Sunday and then to our Congress Tuesday. We could only find one faint, far-away radio station on our dial that carried today's speech. Such a travesty and sign of worse to come! You don't need ANYONE's permission to defend yourself. The solution is quite straightforward. All threatened nations - practically the rest of the free World - must assist Israel first materially to destroy the Iranian nuclear sites by whatever means prove necessary, then use all necessary political clout to protect Israel from any backlash. A total embargo on all transactions with Iran at any economic level and the utter proscription of all diplomatic relationships would go some way to fulfilling these ends. I believe that many who criticize Netanyahu, secretly wish that Israel will do the dirty work of opposing Iran and stopping its aggression, and know that Israel will ultimately make its own necessary decisions. Unfortunately, I believe that much of the anti Israel rhetoric in the mainstream media today is an expression of antisemitism. This is extremely frightening. It is refreshing to read the comments on this website. Unfortunately, the Obama administration is not listening to the voice of reason. It seems to even deliberately oppose it -- to the obvious -- but not perceived by Obama -- detriment not just to few countries in the Middle East, but to the whole world. He makes use of the most unjustifiable pretext that will affect the fate of the world. The fact that he does not understand the seriousness of this nuclear threat -- including to US -- shows his lack of deep insight into the world situation, especially when it comes to Iran's openly expressed threats of their destructive intentions towards US, Israel, UK and Europe and other countries. It is most distressing to see that Obama is blind and DEAF to Iran's expansionists ambitions. Just as Churchill deserves to be admired for his clear thinking abilities and actions, so should Netanyahu be admired for his efforts to save the world. We can only hope that Obama will suddenly "see the light" and change his attitudes to more responsible ones. Speaking for millions of Americans, he is not alone. So many of us stand with Israel, and will not forget our covenant with Israel. The man in the white house does not speak for us. When will America wake up from it's slumber? Stand up and rise up with Netanyahu, Abott (Australia), Harper (Canada) and unite with people of nations who will live and die for Ffreedom against oppression! As one Washington Post columnist said -- decrying the need for the Israeli Prime Minister's appearance and speech in front of Congress -- do you think Congress doesn't know the details of Iran's nuclear ambitions, power, and intentions? Of course, the answer is, of course most of them do. That's not the point, though. There's a difference between knowing details and gathering the will to act upon the knowledge, in fact even more important -- considering the knowledge you possess sufficient and urgent enough to demand you act NOW upon it. The president and half the Congress and for that matter apparently most of the Europeans do not consider the knowledge they possess of Iran's openly stated intentions and power to demand any action except -- if even that -- a threat of future sanctions if a future atomic bomb appears in Iran. But then as with Hitler, and his rearmament, it IS too late to gear up willpower, military power, political consensus to REact. By then as apparently the president desires the Middle East will be an Iranian sphere of influence, and Israel will be in the former Czechoslovakia's situation. A sacrificial lamb for Iranian slaughter. What precisely will be the Poland that was the RED LINE resulting in British declaration of war, great suffering, great heroism, and eventual victory. All the president's red lines have vanished. But it IS clear he does not consider Israel even a pretense to one. And what is his or the future president's committment worth when we see his present Sunni allies scrambling to protect themselves, from the collapse of the American umbrella? So...Prime Minister Netanyahu's task is NOT knowledge delivery, but an encouragement to consider the need for resistance to Iranian nuclear development a present and immediate danger to the Middle East, Europe, and eventually the USA. At least Resist, if you won't Act. Netanyahu's wisdom will be like pearls before swine. "The alternative that the prime minister offers is no deal, in which case Iran will immediately begin once again pursuing its nuclear program, accelerate its nuclear program, without us having any insight into what they're doing. And without constraint." Obama: "The Supreme Leader has issued a fatwa against the development of nuclear weapons, and President Rouhani has just recently reiterated that the Islamic Republic will never develop a nuclear weapon. So these statements made by our respective governments should offer the basis for a meaningful agreement. We should be able to achieve a resolution that respects the rights of the Iranian people, while giving the world confidence that the Iranian program is peaceful. But to succeed, conciliatory words will have to be matched by actions that are transparent and verifiable." So which is it -- is there a fatwa against nukes that Barack believes or not? His statement yesterday suggests that his original belief was totally misstated since he now offers up the dire and contradictory results that the Netanyahu strategy will in fact lead to a bomb. So he knew the Iranians lied originally, but pretended to believe their lies at the time giving a false premise for the negotiations with Iran. Or he believes them now but is faking a belief in the perfidy of the Iranians to impugn Netanyahu. Which is it folks? Which false statement is correct? Colonel Kemp's excellent piece included this statement: "Iran's ballistic missile program, inexplicably outside the scope of current P5+1 negotiations, brings Europe into Iran's range, and future development will extend Tehran's nuclear reach to the US." Colonel Kemp sees a historical parallel between Netanyahu and Churchill and I see similar between Col. Kemp and Orde Wingate. Truly there is nothing new under the Sun. Thank you Colonel Kemp for your thorough explanation of the potential crisis the world could face. Hopefully everyone will accept Benjamin Netanyahu's words with grace and action. Colonel Kemp's article is a warning bell for us all. Alas our leaders are Chamberlain-like in their treatment of the mullahs in Iran. Appeasement does not work. Does no one learn from history? This President has decided to switch alliance with one group of "crazies" for another group of "crazies" who long term-wise are far more dangerous! We must remember that when Adolph Hitler started his onslaught of Europe, Britain declared war on Germany. The US was reluctant to get involved. It took Japan's bombing of Pearl Harbor for America to join the fight. Let's hope Congress listens to Netanyahu and does not demonstrate the same reluctance to get involved. The risks to the US are even higher this time. However, US reluctance may trigger Israel to go it alone, trusting God for the fulfillment of the promises He made. No one wants war, but Iran is just playing a game, they will never stick to any agreement, they never have and those who support negotiations with appeasement to this rogue state are simply delusional and suicidal. Due to the watchful appeasing eye of President Obama, Iran or its proxies has gained control of Lebanon, Syria, Iraq, and lately Yemen. It has stated many times that it's avowed intention is the destruction and elimination of Israel. Israel has more knowledge about the nuclear intentions of Iran. Listen to Netanyanhu ! We can only hope that Obama is prevented from signing this worse than useless treaty with Iran. I don't know whether Congress can prevail as I'm uncertain as to how the veto works but unless he can be stopped, we are in danger of annihilation. Obama knows not whereof he speaks nor does he understand (or choose to understand) what Iran is capable of. It's hard to believe that anyone can be as blind and ignorant as this president appears to be but one has only to look back to Chamberlain to understand that politicians are truly capable of great naivete and lack of understanding of what they are facing. This article tackles some important issues. Netanyahu's solo voice against the insanity of US and EU current policies and the dangers therein. It is beyond description and totally incomprehensible our unwillingness to see the realities before our very eyes. I am developing a thesis. The threads of danger which the world is ignoring, denying and even embracing is part of the "Zombie Apocalypse Factor" which refers to a world gone mad in its delusions and denial. That simply, in my view, is the world that Netanyahu is battling. I wish him well. Don't hold your breath. Excellent article. I will forward. This excellent article is marred by an unfortunately common mistake. The author writes, "For Netanyahu the risk is to his own political life and to his country's relationship with the United States, given the intense presidential opposition to his speech." The mistake is the assumption that offending the President is offending the United States. In fact, no president is in any way the unique representative of the United States. The United States Constitution guarantees a government of three powers, with "checks and balances" among them: the legislative (Congress), the judicial (the law courts), and the executive (the president). It is too bad that many even educated, English speaking people, including American-educated immigrants to Israel, do not understand this. Congress, indeed, the House and the Senate together, is much more powerful than the President. Congress has the power and duty to make laws, including laws binding the President, himself. It might be thought that the three powers which I have mentioned are equal. But this is not quite true. The Founding Fathers of the United States, having revolted against a king, were particularly fearful of creating a king under another name, a dictator in the guise of a "president". So they took particular measures to control and to restrict the powers of the president. In brief, Congress, with its duties to legislate, has all rights to the information needed for proper legislation. Surely they have an unquestioned right to invite whomever they please to speak before them and to help them educate themselves to perform their duty. The President has no authority whatever to interfere with this right of the Congress. In accepting Congress' invitation to speak, the Prime Minister of Israel paying the United States all respect and honour. I have no quarrel with the message but I do with the tactic. He could have been as effective, perhaps more so, utilizing appropriate methods. Antagonizing your best ally is no way to defend your people. He was invited by Congress, the representative of the American people, to give a speech and by accepting the invitation he antagonized the President. As we have seen there are presidents who are allied with Israel and those who are not. This particular one certainly is not and demonstrates his presidency in a dictatorial manner. He is destabilising the Middle East and if left to him there is going to be a conflagration after which he will turn away wiping his hands clean of the erasure of that "damned spot"! OK, now which part of "It must never happen again" Never again! do people not understand. WE have lived through Germany's extermination of the Jewish people. WE have lived through the Russian Gulags. WE have lived through the Japanese Prisoner of War Camps.The dropping of two Atomic Bombs on Japanese Cities. The destruction of great Cities in England and Germany and many other Cities of Europe. When will Mankind learn that HATRED is not an option for any of us. No one race is more superior than any other race. No Religion is above any other religion. Also the amount of waste and destruction put into these WARS is criminal wastage. There is enough food, water, clean air, on this planet for all our needs but insufficient for mankind's greed. I would like to thank you for a clear presentation of the threat to the world represented by Iran. Our current path appears to be to appease, at all cost, a totally evil regime. 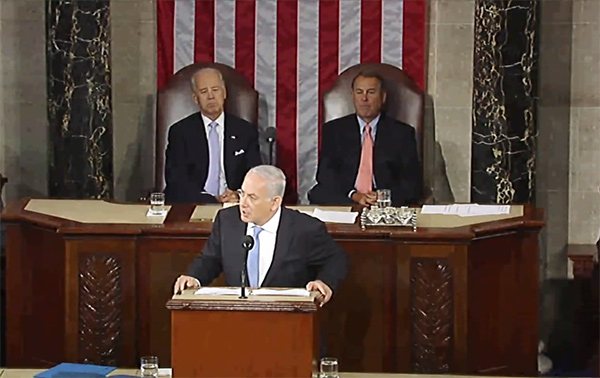 I am hoping that our Legislative Branch listens closely to Prime Minister Netanyahu and follows his advise. Iran has never hidden its intent. Why doesn't the Western Elite pick up on it? The only thing Iran needs to do now is put up billboards in our country advertising the carnage they wish to dispel and on whom. Still, the elite would ignore the warning. We have seen it all unfold before. It is quite evident that Iran cannot be allowed to have the capacity to produce nuclear bombs. The regime and the whole area is to volatile. You are right, if Iran were to produce a nuclear bomb, they could give it to a nut job proxy who would fire it against Israel from a place other than Iran to avoid retaliation, the Gaza Strip comes to mind, The question then becomes: How do we proceed from here? Should Iran have any kind kind of Nuclear capacity? Should Iran have a peaceful nuclear capacity? Iran is not trustworthy. How do you ensure that Iran is not secretly building a bomb no what it promises to do or not do in a treaty. The best and only way to do this to have the right to unannounced unbridled inspections anywhere in Iran. I don't think Iran would go for this. What provisions should be in a treaty limiting Iran's capacity to build a nuclear bomb that would satisfy Israel and any knowledgeable sane person? I stand with Israel and applaud Netanyahu for courage and doing the right thing to speak up for Israel and Democracy everywhere. In a time when our leader seems to have "another agenda" in mind and is not looking out for America or Israel I'm glad someone is!! Would to God we had more leaders like Netanyahu!! My God help us all we are entering the war of Armageddon! Iran claims that it is developing nuclear energy for peaceful purposes. OK, that may be so. However, why not use this knowledge for military purposes also? Having an atomic bomb would greatly increase respect for this Third World country. Why would they not build one if they have the knowledge to do so? The are spending billions of dollars developing nuclear energy. I'm sure they want to get more for their investment than using this knowledge for medical research as well as energy needs. I think it's amazing that world leaders are playing Mickey the Dunce so they won't have to confront Iran. This is exactly what happened that is described in the above article. The opposition by the Obama & Kerry to listen to Netanyahu is becoming more & more suspect. Israel is kept out from relevant information yet it is the first in the Iranian fire-line. Why are Obama / Kerry so adamant to keep Israel away? ?.Chamberlain did the same thing by giving Hitler carte blanche on Czechoslovakia & the rest of Europe. Why not listen to what Netanyahu has to say without being so insulting ? They either don't get it, don't know history to understand it, or obscure, minimize or pretend they can manage any situation; the latter being Mr. Obama. For five years now I could see this coming and one by one each so-called power for whatever reason became putty in the hands of the Ayatollah. I am convinced the vacuum that was once filled by an assertive strong leader the USA held all of it together until international apologist President Obama took office bowed to the King of Saudi Arabia thus submitting himself and the US by extension to the King and Islam. He also bowed to the Emperor of Japan. Thank God not as many of our WW2 vets were around to see it. Now, we one of a few but the key ally being shoved under the bus. Mr. PM speak up this will be your best shot. Great insights and analogies yet once again from a knowledgeable thoughtful military leader. PM Netanyahu might be today's CHURCHILL -- and the world can, definitely, use a Churchill right now, but, unfortunately, Obama IS NOT today's Franklin Roosevelt. Sadly, Obama seems a lot more like today's Neville Chamberlain. PM Netanyahu's speech is probably the most important speech in a very long time and will be listened to around the world, I hope. If not, PEACE IN OUR TIME WILL BECOME THE END OF OUR TIME. Thanks for the warning Colonel Kemp. I believe Kemp has distracted us from the obvious comparison between Lord Chamberlain and President Obama. Should anything else be added to this meaningful observation? The lone voice because so many in the US, in the EU subscribe to antisemitism. From California to NY to Europe to the whole ME and N-Africa. And even in his OWN country!! !